History: (What If? II#62) - After a night of drinking, the man known only as Logan was attacked by soldiers of the Weapon X program. Unfortunately for the soldiers, Logan managed to subdue them and escape. With their subject gone, Weapon X recruited former mounty and Marine Guy Desjardins, whom they kidnapped and bonded the rare metal adamantium to. During the experiments, the adamantium accumulated in Guy's fists and manifested itself as spikes that protruded from his forehands. When released from his drugs, Guy (now codenamed Weapon X) immediately went on a killing spree until the Weapon X guards managed to drug him once more and drop him off at the Canadian government office known as Department H. Dr. James Hudson decided to take him onboard (against Dr. Walter Langkowski's wishes) for the budding Canadian superteam that he was organizing. As the team was training, Weapon X managed to break loose and kill Dr. Langkowski, prompting Dr. Hudson to call in the team despite their lack of full training. Escaping, Weapon X made his way to Kenora, where he killed the husband of one of Logan's friends. 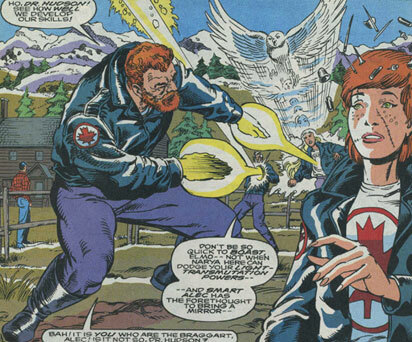 The Canadian superteam (called the Flight while in action) followed Weapon X to Kenora, where Stitch attempted to shut down X's harness with her powers but she unfortunately got too close and was impaled on the adamantium spikes that Weapon X possessed. When Weapon X defeated them, Smart Alec suggested they call in the Avengers but Dr. Hudson explained that when he sent the team out early, Department H cut off their communication. He then told his assistant Chantilly to ready the Groundhog armor and that he would pilot it. Smart Alec quickly thought of a plan and got close enough to Weapon X to disrupt his harness, only to be killed himself. As Weapon X continued on his killing spree, an avenging Logan discovered Department H's ties to the Weapon X program and confronted the program, where he downloaded their files onto a disc. As he left, the Flight arrived in Calgary where they made another attempt at halting X's killing spree. St. Elmo quickly grabbed Weapon X and flew him high into the air, where Weapon X knocked him out, causing Elmo to fall and get impaled upon a church's cross. Snowbird responded by transforming into a polar bear and attacking Weapon X one-on-one. After Snowbird took a slashing, Dr. Hudson (wearing the Groundhog armor) attacked Weapon X himself and was also stabbed. As both Snowbird and Dr. Hudson died, Logan arrived on the scene with a huge arsenal. Logan then fiercely battled Weapon X, eventually removing his helmet and decapitating Desjardins. Government soldiers quickly arrived on the scene and placed Logan under arrest for his theft of government records, but Logan dove into the nearby river, leaving his pursuers to think him dead given the amount of blood he had lost in the battle. Days later, the proof of the government's involvement in the release of Weapon X and their role in the creation of the Flight was all over the news. Watching television, Logan recovered from his wounds and finally found inner peace, having avenged the death of his friend Thomas. Comments: Created by Kurt Busiek, Ron Randall, and Art Nichols. Sorry about the bad picture of Johnson there. His only on-panel appearance was when he was killed by Weapon X and even then, all we saw were his arms as he was slashed. This is the best I could get. The divergent point of this reality would be at the point where the Weapon X soldiers captured Logan in the Earth-616 reality (instead of him escaping, like in this reality). This seen in Marvel Comics Presents#72 (March, 1991). The Flight was a group of heroes-in-training who were intended to be Canada's version of the Avengers. They were: (from left to right): Dr. James Hudson (back turned w/red shirt), St. Elmo, Smart Alec (getting blasted by Elmo), Snowbird, and Stitch. They were pulled from training early to help combat the escaped Weapon X, whom they followed across the entire country of Canada. Not fully trained or experienced, the Flight were quickly killed one-by-one by Weapon X.
Dr. James Hudson had no superhuman powers, but used firearms and eventually a suit of armor called "Groundhog," which boosted his strength. St. Elmo possessed the ability to manipulate light for varying effects and could also fly. Smart Alec had a genius-level intellect. Snowbird (Narya) could transform into the form of any animal from the Canadian wilderness. Stitch could manipulate small amounts of metal. Jackie Smith was an old friend of Logan's whom Logan visited while trying to discover the origins of Weapon X. Eventually, Logan managed to threaten Jackie into telling Logan to search for more clues at Department H. After telling Logan, Jackie knew that Logan's search would lead him to the Weapon X labs, where Jackie and a group of soldiers caught up to him. Logan warned Jackie to let him go or he would stop anyone who got in his way and Jackie let him go. 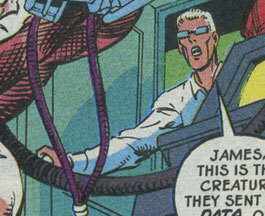 Johnson was one of the soldiers working for Weapon X who was killed by the awakened Guy Desjardins. Dr. Walter Langkowski was a scientist working for Department H who had strong disagreements with Dr. Hudson over his idea of taking in Weapon X for use with the Flight. His suspicions were correct when Weapon X escaped and Dr. Langkowski became X's first victim. Dr. Langkowski did not show any superhuman powers. Logan was a former Canadian government agent who was attacked one night by soldiers from the Weapon X program. He was able to subdue them and months later, he was shocked to find his friend Thomas dead and his widow Rose crying. Vowing vengeance, Logan spoke with a few of his old contacts and discovered that Department H had a hand in releasing Weapon X upon the public. Visiting the Weapon X labs, Logan downloaded all of their files onto a disc and left, threatening anyone who tried to stop him. He then made his way to Calgary, where he confronted Weapon X one-on-one, eventually decapitating the escaped monster. Afterwards, he escaped arrest by leading the Canadian government to believe him dead. He then subsequently sent the information disc to the press, who revealed the government's role in the creation of Weapon X. Logan then relaxed and watch the events unfold, having found peace by avenging Thomas's death. Commander Logan had a mutant healing factor and presumably had superhuman senses. Unlike his Earth-616 counterpart, Logan never manifested his claws and never had adamantium bonded to his skeleton. Rose was a twenty-year old friend of Logan's who lived in Kenora. Her husband was killed by Weapon X, prompting Logan to avenge his death. Thomas was a friend of Logan's, an RCMP officer, and the husband of Rose. He was killed in Kenora by Weapon X, prompting Logan to avenge his death. Guy Desjardins was a former Canadian mounty and Marine whom the Weapon X program kidnapped. While in their capture, he had adamantium bonded to his skeleton and some of the adamantium concentrated in his fists, causing him to manifest spikes that protruded from his forehands. 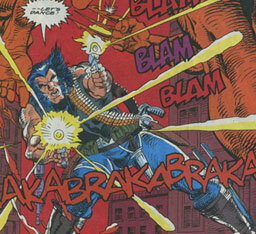 Whenever he was not drugged, Weapon X would rampage wildly, killing everything in sight. In order to pass their failure on to someone else, the Weapon X Project dumped Guy at Department H, who attempted to take him in as one of the early members of the Flight. Unfortunately, before Weapon X could even begin training, he escaped and killed Dr. Walter Langkowski. He then went on a savage rampage across Canada, killing Logan's friend Thomas, all of the Flight, and at least 50 others. Eventually, Logan made his way to Calgary, where he battled Weapon X one-on-one, eventually unmasking and decapitating him. 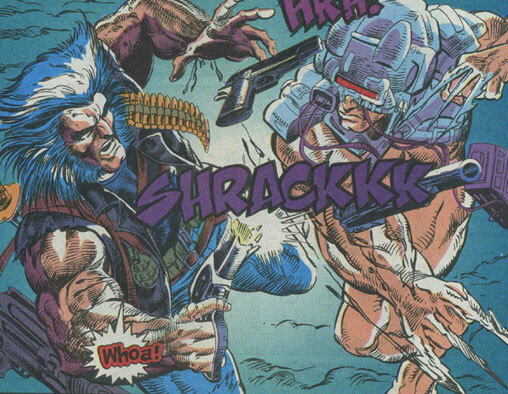 Weapon X had adamantium spikes that protruded from his forehands that could cut through nearly any substance.